On Saeed Akhtar Mirza’s Arvind Desai Ki Ajeeb Dastan. Most lives are — let’s admit it — unexceptional. They are not necessarily uneventful or unhappy, but they are not profuse with incidents either. Less because of the fact that they do not set out to seek and more because fate wishes it that way, adventures — big or small, earthly or magical — simply do not happen to the majority of population. More commonly, a template of routine sets in and hardens with time, against whose fixed boundaries life bounces to and fro, up and down, until it is snuffed out one day, making the occasion of death itself the most remarkable. Arvind Desai is rich and handsome. He has inherited a business in carpets, artifacts and furs. He takes his secretary out on lunch dates, and, come dinnertime, he whores around. He drives a black Premier Padmini in a city where commuting isn’t fun. He plays squash in whites and browses at balmy bookstores. He comes from fine education. His spiffy suits, down to the billowy bell-bottoms, reveal his tastes in the fashion of the time. If seen as a still image he seems a charismatic hero who could break into a song any time, and, given a fair reason, break bones of the baddies at shady docks. 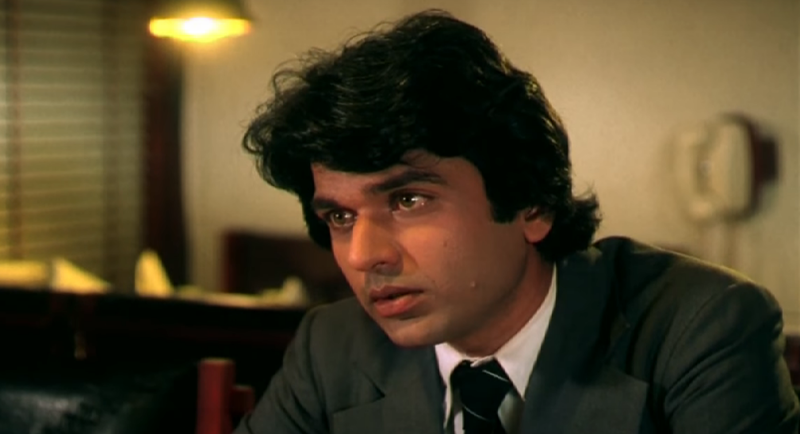 But seen in Saeed Akhtar Mirza’s Arvind Desai Ki Ajeeb Dastan, released forty years ago, in 1978, he comes across as rich but unsatisfied, handsome but haggard, well known but lonely, stylish but stifled, educated but disenchanted. He is a hero, in other words, who opts for a ruminative dialogue instead of a song, and, when accosted, stares mutely at the baddy who rages with threats. When push comes to shove, Arvind Desai might as well tumble down on his own volition. 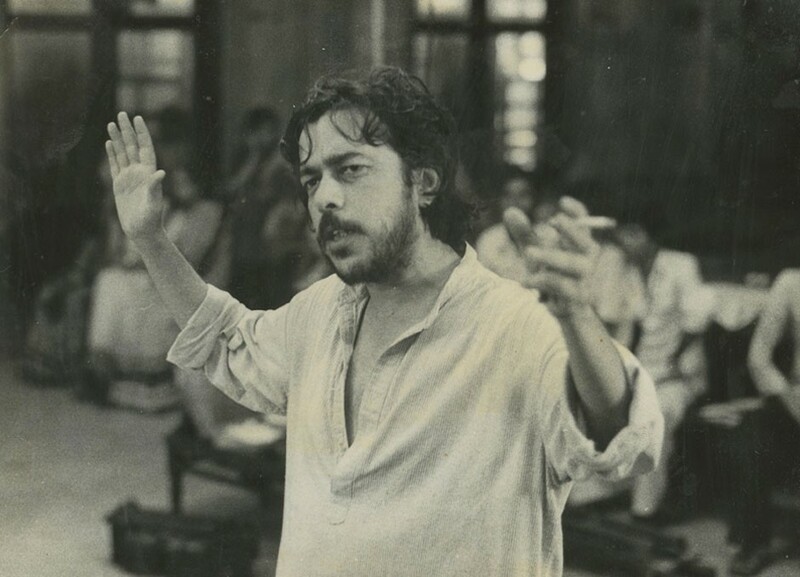 Saeed Mirza graduated in film direction from FTII, in 1976, and dabbled with documentaries before he debuted as writer-director with Arvind Desai. The film is set unmistakably — and, like all of Mirza’s subsequent films, passionately — in Bombay. The claim to place and period is insistent: The monsoon and blackened tile-roofed bastis, the flooded streets and BEST buses, the seaside promenades and local trains all make an appearance; large hoardings of the popular Hindi film release of the time, Amar Akbar Anthony, drive in the specifics. This contextualization is, to a large extent, irrelevant to Arvind Desai’s conundrum. But Mirza — now aged 74, and for long retired from filmmaking — was Bombay to the bone. His indulgence in — or, as I’d like to believe, his paean to — the beloved city of his birth showed up in each of his films. He chronicled the city’s challs and its downtrodden denizens, from his documentary-making days to his later, more acclaimed productions, with a sensibility that was righteously, truthfully tuned to tap into the pulse of the metropolis’ urgently contemporaneous issues. Mirza’s first film is, however, an intensely personal affair; a glancing take on the socio-political issues that would, in his later works, become his principal subjects; a work of an artist trying to find his footing in a vocation as tectonic as cinema. In Arvind Desai, Mirza creates an alter ego who, although born into aristocracy, is not blind to the plight of the underprivileged. The first time we see Arvind, he is staring out the window of his car at a street show. Staring is one thing, looking altogether another. Arvind has eyes for the poor but his vantage point is from the comfort of his high society life. He might harbor contempt for that high society, and the especially ornate, but his contempt is of the listless type: a dissatisfaction that is simmering and self-consuming but unable to explode into outright outrage. He is a restive soul of utter inactivity. All that he owns has come to him as patrimony; and all that he yearns for is beyond his comprehension. He is lost and in need of answers. Played by the insanely good-looking Dilip Dhawan, Arvind Desai cuts the right balance of a privileged but self-effacing individual, of a man who is vaguely aware of his worth but one who couldn’t care less to give it all up in exchange for… What? Arvind’s lumbering gait and downcast gaze show him to be a man of diffident disposition. That hesitancy is further aggravated in the company of his father, played with a drawling disinterest by Shriram Lagoo. “Usse har tarah hi azaaadi di maine. I treated him like a friend,” he says of his son, who’d surely have something to say on the matter. But, to paraphrase Gide, the difficult thing is knowing how to live with that freedom. That knowhow dearly eludes Arvind. This is a difficult film to watch; contemplative cinema that offers little in terms of entertainment or plot. That said, it is richly rewarding if you’re in an existential groove of your own, and, if it manages to shake you up on first viewing, it surely bears revisiting — even forty years later. A film this tautly humorless could easily have spiraled down into a maudlin tale of ceaseless self-pity; or, worse still, made us dismiss Arvind Desai as an aimless dandy whose troubles are nothing the nuptial vow couldn’t cure. Mirza eschews these possibilities by refusing to make Arvind the central presence in the film. Even as the character is turned inside out throughout, there are instances where Mirza forks the narrative to explore such issues as societal inequality. This switch gives not only the film but the character of Arvind Desai itself a new dimension: Arvind is a “good” guy, but is he so innocent when viewed from the other side of the class divide? In reply, Mirza takes Arvind Desai out of the picture. The camera, instead of following his movements, stays fixedly after his exit, as if it were left to roll for thirty seconds longer. Like when Arvind forgets to collect his change at a liquor store, the storeowner, far from grateful, quips, “Saalon ko paise lene mein bhi takleef hoti hai.” Arvind Desai might be sympathetic to the majdoor who make the carpets he sells, he might bat for granting them higher remunerations from the exploitative agents, but in the eyes of the poor he is still the rarefied rich, someone to be mistrusted and derided. Another such sequence is when Arvind accepts a lunch invitation at his secretary’s house. The secretary’s household, middle class and apparently fatherless, is flustered by the occasion, and driven to limits to put up its best side. Even at the table, where Arvind tries to make small-talk and lighten the mood, the family’s insecurities do not give in. Arvind Desai — merely because of his affluent roots — remains a permanent outsider. Also, his suddenly found generosity and garrulity with the family makes us doubt his softer side: How much is it out of true concern; and how much out of utter desperation to flee the life he has been burdened with? This is a scathing study of the friction inevitable at the clash of the polarizing worlds of the high and the low, the rich and the poor, the beautiful and the squalid. Much like in Bombay, where slums and high-rise buildings exist next to each other, separated by a very thin line. Mirza is tracking that thin line by stationing Arvind Desai on the front: at dingy brothels, at street-side shows, at a friend’s place in a narrow hostel room. He is then as much a window into decrepit lives as much as he is a man out of his depth to understand that very decrepitude. Mirza makes his point broadly, most telling, in the opening scene of the film. We see a village, small and unbeautiful. Women squat, their faces covered with ghunghat; sinewy kids work on handlooms, helping out the men who are marking, punching, weaving, sewing, embroidering and burnishing handmade carpets. We see one such carpet in its final finished form hung out to dry against a wall. The scene melts. The very same carpet is now on sale at a swanky store. We see a hand caress the luscious carpet. The sweat of the working-class has turned into a smooth surface for the rich. Even before a word is said we know on whose side Mirza’s sentiments truly lie. Even by “parallel” cinema’s bleakly unromantic standards, Arvind Desai strikes as a cheerless, hopeless film. We expect — conditioned as we are by countless such instances — for a “trigger” moment, for that poetic or tragic or simply sensational moment of blind epiphany that turns our hero’s doubts to dust, that puts him, so to speak, on the right (righteous) track of redemption. If only. Instead the film tethers to Arvind’s unremitting cluelessness and continues to drift like a lone cloud. This languor itself takes the form of a suspenseful subplot: Because we do not know what it is that Arvind is after, we do not know what he might encounter at any given moment. This is most acutely felt during the long, ponderous car rides with Arvind at the wheel. (In another part of the world, an equally disconnected but doubly febrile individual named Travis Bickle once trundled in similar bafflement at the cesspool of a megapolis surrounding him. We know how he ended up. Or maybe we don’t.) The camera is either perched beside Arvind or placed outside on the bonnet. The hubbub of the streets, and, occasionally, to herald a visit to the brothel, an old Hindi number kicks in contrapuntally — “suna hai teri mehfil mein rat jaga hai.” Traffic flits by like running water. Otherwise, a doleful silence pervades the scenes. It is during these moments the film ratchets up from a merely visual to that cinematically rarer temporal experience. Time turns into an accomplice as well as an antagonist — at once too much on our hands and yet winding down all the same; realizing this, it is impossible to not be invested in even the most banally unfolding events. Like an insomniac sensitive to every nocturnal ruffle, nothing is lost on us. What seems shoehorned in Arvind Desai is the politics. We hear talk of the bourgeoisie and communists but it is simply staged and bereft of context or allusion to serious political leanings. These are the film’s weakest, most posturing scenes. Arvind Desai himself is as apolitical as Grigor Samsa, but is friends with the “leftist” Rajan, who teaches philosophy and to whose rooms Arvind frequents in search of answers to his loaded questions. Rajan’s answers, intoned in barbed baritone by Om Puri, are nothing but ideological boilerplate. Mirza’s films worked best when the politics collapsed into the personal. His stylistic and aesthetic austerity suited perfectly when married to the murmurs of discord and dissent that sundered middle-class families — and, above all, minorities — in the face of the full-blown ferocity of high politics. Even his most overtly political film Naseem (1995), made in the wake of the Babri Masjid demolition, echoes with concern for the repercussions on working-class households in an increasingly nationalistic, religiously fanatical, vociferously communalist India. (Released in the same year as Naseem, Mani Ratnam’s Bombay gave the topic of communal unrest of the time a more mainstream treatment, complete with romantic song-and-dance sequences thrown in; Mirza’s arthouse approach, on the other hand, went well with the somberness of the subject.) Films like Albert Pinto Ko Gussa Kyo Aata Hai? (1979) and Salim Langde Pe Mat Ro (1989) bear witness to an era of a tough but tolerant society held together by communal harmony, a society which, in the small dwindling pockets where it still exists, is under as grave a threat now as it was then. That way, Arvind Desai is more inward looking, and acts as only a primer for the social critiques that came later. Which makes it unique (and to be me the best) among the half-dozen major features, all of them gems, that Mirza made. The “nahi” — a ringing “No” — is more than just a sharp disagreement. It is both a defensive retort and a brutal rebuke. Even here, at his most vulnerable, Rajan refuses to be classified, in any way, with Arvind and his high-class clique. What Mirza does next — through a daring demolition of the fourth wall — is perfectly bookend his debut film, done less for the effect and more as a way to underscore his major theme. We see, again, people from the working class, perhaps those from the opening scene of the film, perhaps of the same village. But this time they stare right back at us, their faces blank as blackboard. Men turn from their handlooms, women with half-covered faces, unsmiling kids — all face us boldly, expressionlessly, mutely. A silent stare, a wordless curse. To the Arvind Desai in us — and perhaps to himself, as well — Mirza seems to say that when the stares of the dirt-poor revert there is nowhere for us to look but at our own sordid selves. Books: I smell, covet and read: Will write one some day.